Many internal control programs are still undergoing major modifications due to increased PCAOB requirements, adoption of the 2013 COSO Framework, and board focus on risk and compliance processes. Organizations are using several technology approaches to manage the process—some with more success than others. 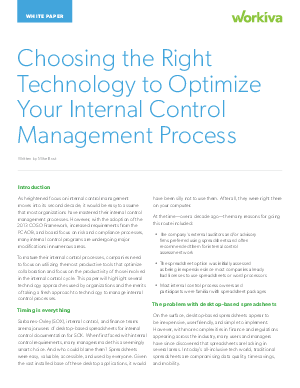 Read this white paper to learn why organizations need to utilize the tools that optimize collaboration and focus on productivity, the pros and cons of desktop-based spreadsheets and GRC platforms, and the merits of taking a fresh approach to technology to manage internal control processes.